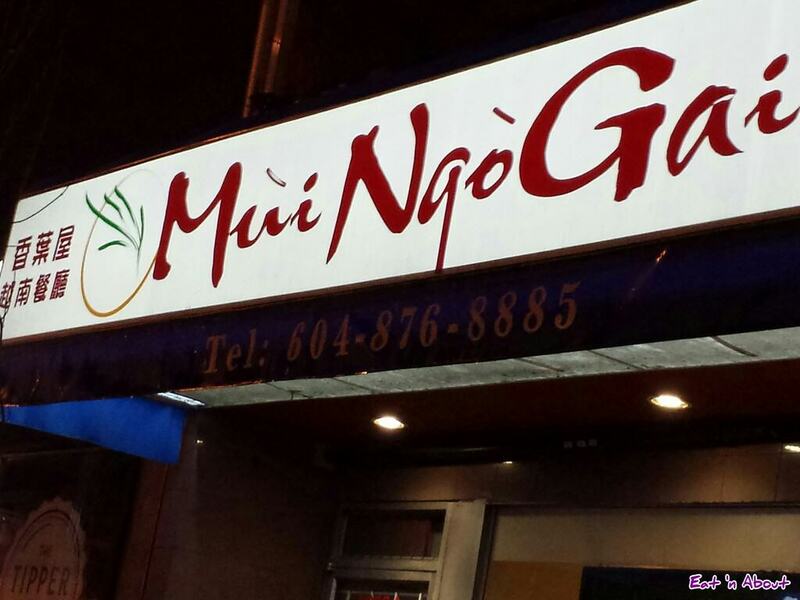 One time while driving down Kingsway I noticed the bright awning of Mui Ngo Gai. That led me to the website address they posted on their window. I thought it was interesting that a Vietnamese restaurant that’s not part of a chain would have a website setup. So I logged on to check them out. Boy am I glad that I did. Mui Ngo Gai is owned by a couple where the wife is Vietnamese. They chronicle (through their blog) their travels to different parts of Vietnam, trying out the different types of pho of different regions, and recreating them at their restaurant. The regions include but are not limited to Hanoi, Hue, My Tho, Saigon, etc. This leads to lots of different flavors and combinations in the “Specialty Soup” section, some of which I’ve never seen before anywhere else in the Lower Mainland. They’ve also included very good descriptions of each dish. Check out Mui Ngo Gai’s website and see for yourself. Of course they have the good ol’ staple of beef pho for the unadventurous bunch ;)…and for those where beef pho in itself is an adventure, their menu has a guide of the main ingredients found in your typical noodle soup. 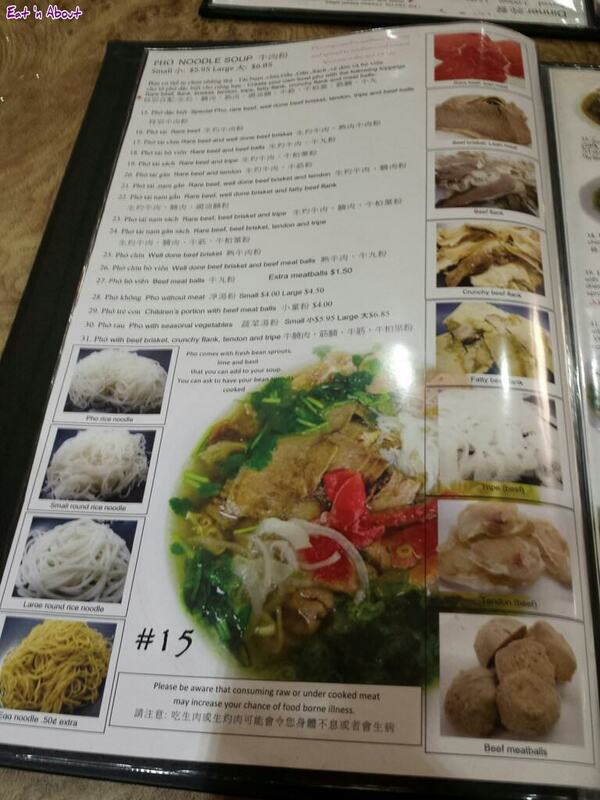 Hitman and I would like to think of ourselves as adventurous…so no, we did not order beef pho. For appetizer, I picked the Bánh bột lọc tôm thịt gói lá chuối ($7.50 , 10 pieces) which is from the Hue region. 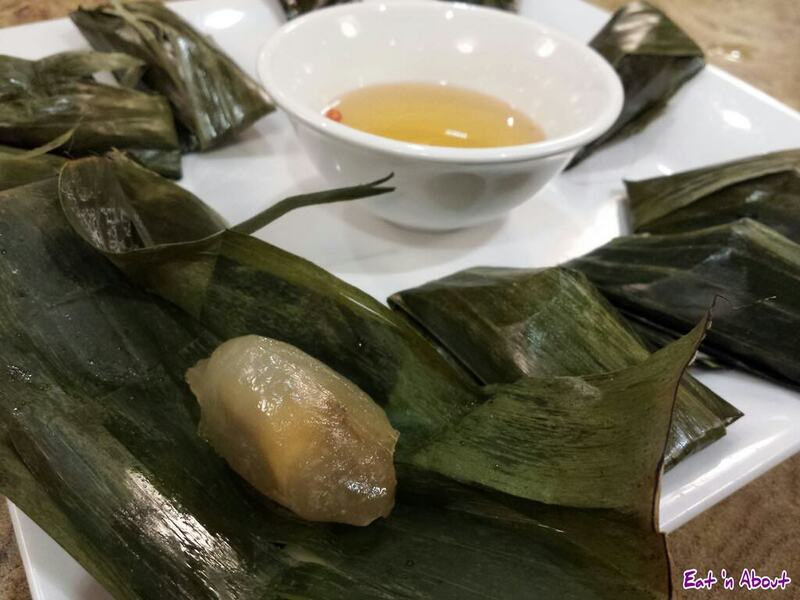 It was a steamed tapioca starch dumpling stuffed with pork and shrimp. I couldn’t wait to unwrap each individual dumpling from its banana leaf blanket, dunk it in ngoc nam, and pop it in my mouth. It was every bit as delicious as I suspected it would be. The tapioca starch dumpling was chewy like mochi, and the stuffing delicately seasoned. My only gripe would be that there’s a bit too little stuffing in each morsel. Nonetheless I enjoyed this immensely. 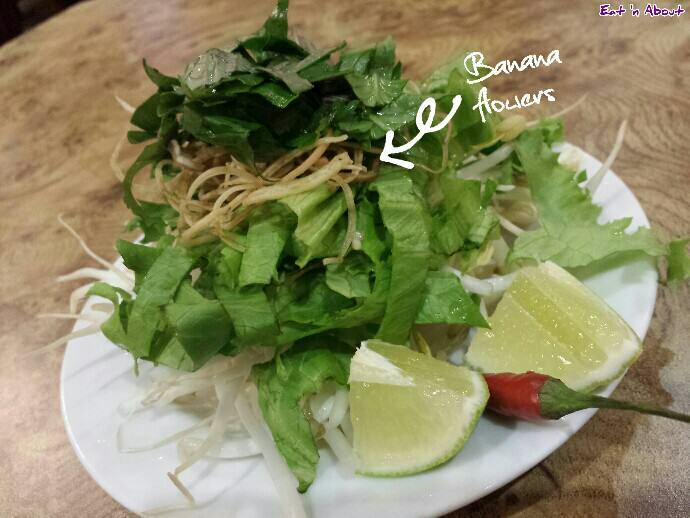 When we got our garnish plate, we were surprised to see some newcomers, namely the banana flowers. We think that it only comes when you order from the “Specialty Soups” section, as we saw that other people didn’t get the same stuff. 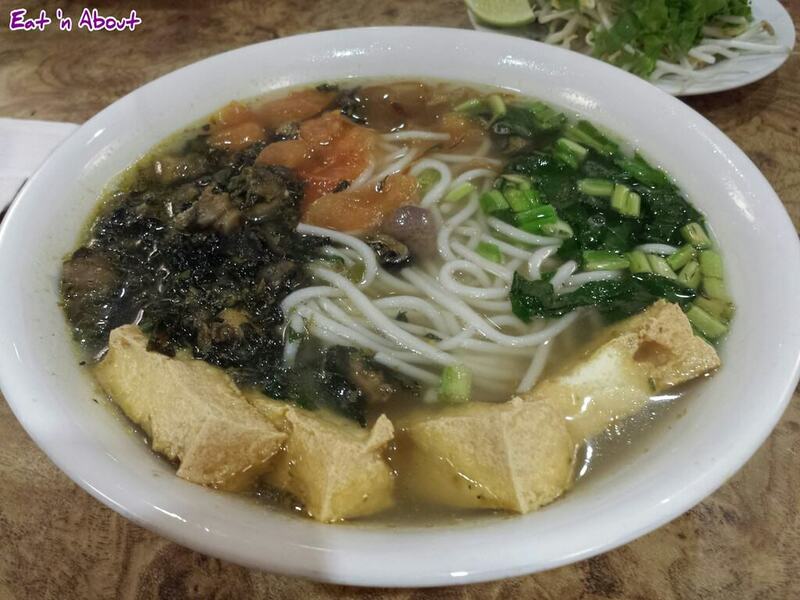 Hitman had the Bún ốc ($8, large only) which is a snail and crispy tofu soup, with caramelized shallots, Vietnamese perilla herb, sautéed tomatoes and large round rice noodle in soup. 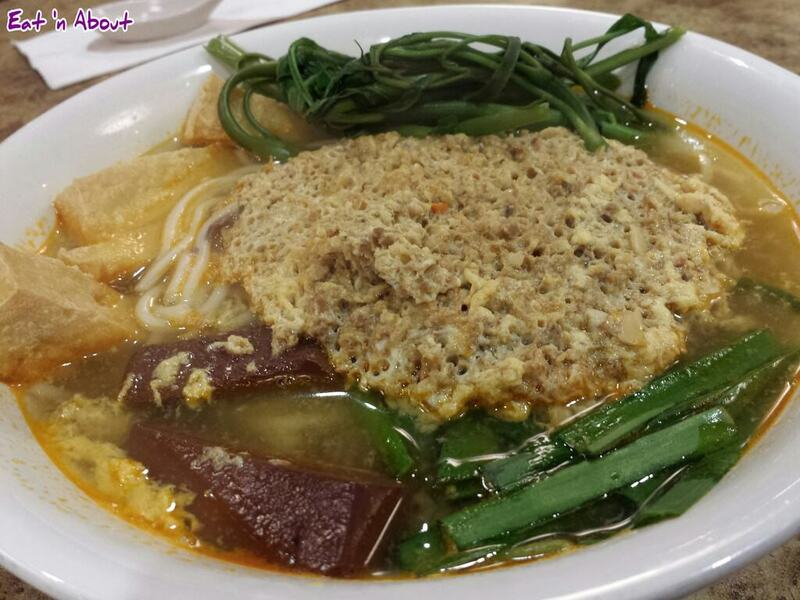 Mui Ngo Gai tells us that this dish is from the Hanoi region. The snails were very tender. They had a bit of chew but not at all tough or rubbery. Their small size really absorbed the flavor of the soup. He really liked it. He knew that snails are a common ingredient in SE Asia but he had never tried it, and he was glad there’s a restaurant close to home where he could have it. As for me, I went for the Canh Bún ($8, large only) which is a large, round rice noodle soup with crab paste, cooked pork blood, tofu, and morning glory (a type of vegetable). This is from the Saigon region. The guide in the menu says that the crab paste is made from reconstituting crushed whole Vietnamese rice field crab with egg, so it is kinda like an egg crab custard. The portion of the crab mixture was pretty big. I tasted some by itself and it was a little savory, but I wished there was a more distinct shellfish aroma. However I think the fact that these are rice field crab means that they’re not from the sea, which would explain the lack of “fishiness”. Nonetheless I still really enjoyed this; the broth was light but flavorful, the pork blood absorbed the flavor of the broth as did the tofu, and the noodles were nice and chewy. I think morning glory is the same as the vegetable know as water spinach/kangkong/tung choi as it has the hollow stem characteristic of it. Overall Hitman and I were extremely pleased with our meal at Mui Ngo Gai, and we really can’t wait to go back!! !